BSNL Kerala Circle has decided to extend the e-Auction of GSM Fancy / Vanity Numbers for 2 Days, i.e., up to 25-06-2015. BSNL Kerala telecom circle started the e-Auction on 17th June 2015. It was scheduled to end the e-auction process on 23-06-2015. 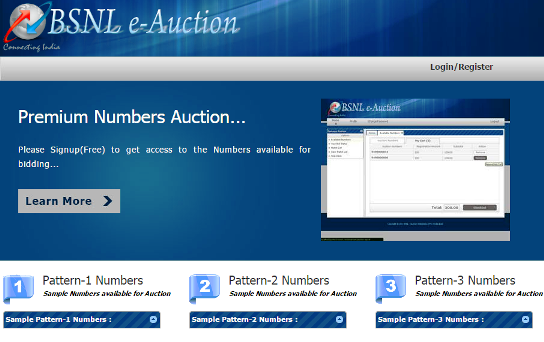 Customers can participate in the bidding through Web portal - http://eauction.bsnl.co.in/ as well as through SMS (from BSNL GSM Mobile Number only). BSNL has decided to extend the date because of the technical difficulties faced by customers in SMS bidding. BSNL is intended to set a platform in order to make these Premium numbers available for the customers who are more fascinated towards Fancy Numbers through the Online Web portal. Dear readers, please share your views and opinions about the e-Auction process of BSNL Fancy Mobile Numbers via comments with us. How many of your have participated the e-Auction process?